Scott Lifschultz, founder and president of SPL Realty Partners, is pleased to announce that T3 TIME TRENDS (formerly TIC TIME TRENDS) has signed a lease and opened its 3rd location at Westfield Culver City. Jason Gregory of SPL Realty Partners exclusively represented t3 Time Trends in this transaction. The 900 square foot store is located on the second floor of the super-regional mall and opened in July. T3 TimeTrends’ specializes in fashion forward watches and wrist accessories, offering the hottest new styles and brands including Nixon, Michael Kors, Vestal, Citizen, Diesel, Skagen, G-Shock and more. The aesthetic is a sleek, clean store that makes a statement within this category. 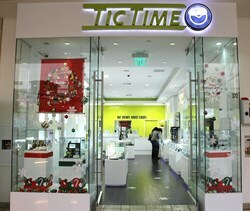 T3 Time Trends is far from the tired old watch repair shops of the past and present. Check out the latest styles at http://www.tictimetrends.com.